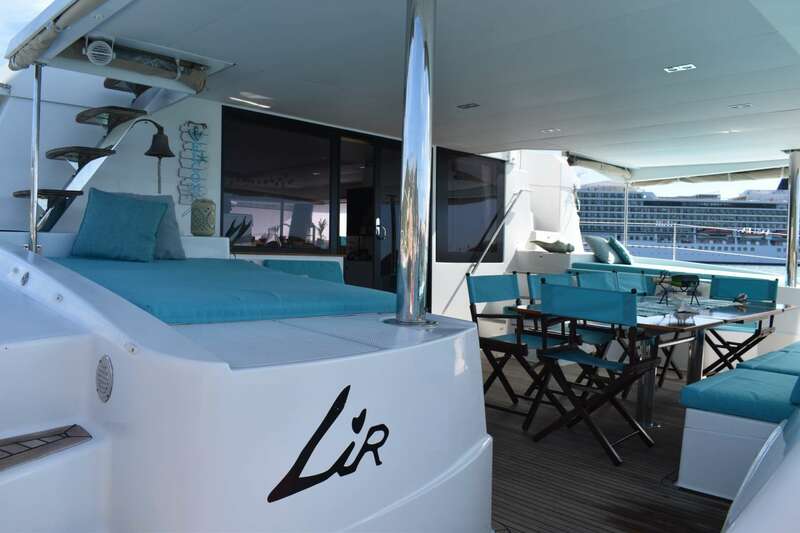 Lir is a Fountaine Pajot Victoria 67 Catamaran. 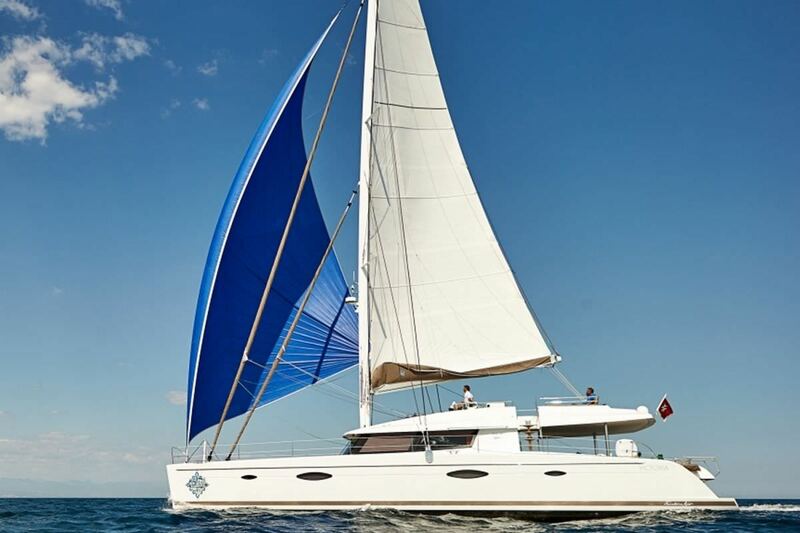 Launched in 2014, she has been built and finished to the highest standards with luxurious, fully air-conditioned accommodation and pleasure sailing as a priority. She has also been equipped with a full range of leisure equipment for the use of the guests. This is all set off at night by her spectacular underwater lighting. Her crew have a wealth of experience within the charter industry supported by formal qualifications. 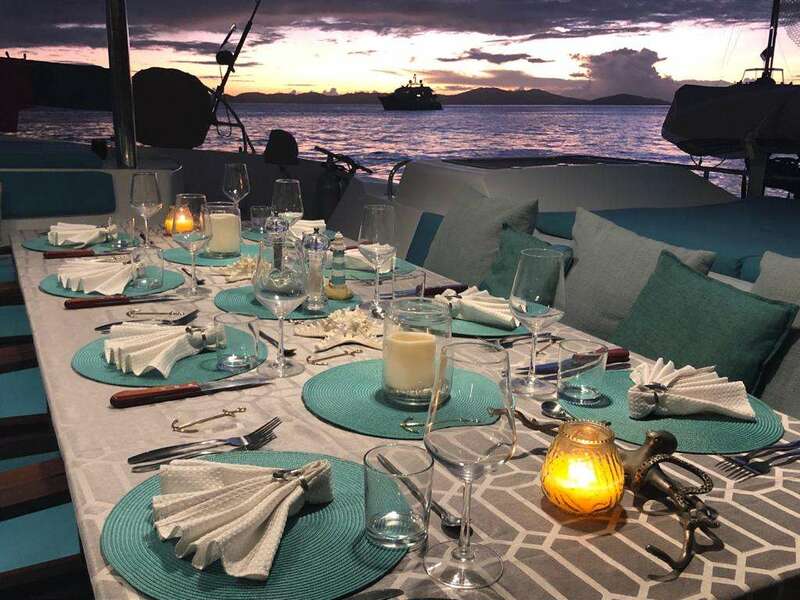 We believe that the combination of stunning destinations, a luxurious catamaran and a perfectly matched crew is the winning combination to make all our guests experiences unforgettable. In addition to the luxury interior, Lir has a full range of water sports equipment to enhance the guest's enjoyment. To make use of the water toys, Lir has a 4m tender with a 50hp motor powerful enough to accommodate the water skis, wakeboard and doughnut. There are also paddle boards and a kayak to enjoy. For the Scuba divers aboard we carry 4 full sets of diving equipment, including a dive compressor and Diver Propulsion Vehicles! (BladeFish SeaJet 7000). The captain isa qualified Dive Master and certified guests are more than welcome to explore the underwater world with the benefit of the crew's local knowledge. All three VIP cabins are on the starboard side on Lir and offer both privacy and luxury on your sailing vacation. 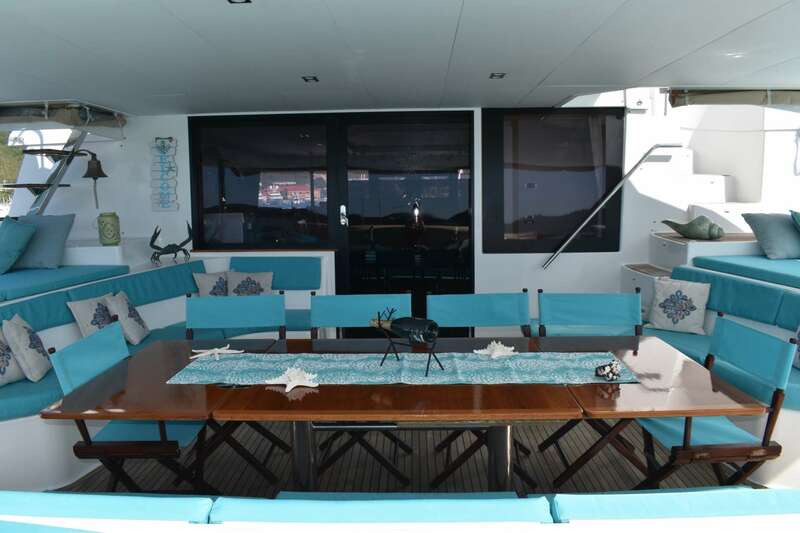 Private access for all of the cabins is from the interior of the yacht and all have en suite bathrooms to go with the level of privacy desired by our guests. Each Guest Cabin has a queen size double bed and enough storage space to easily accommodate a couple whatever length of holiday you desire. 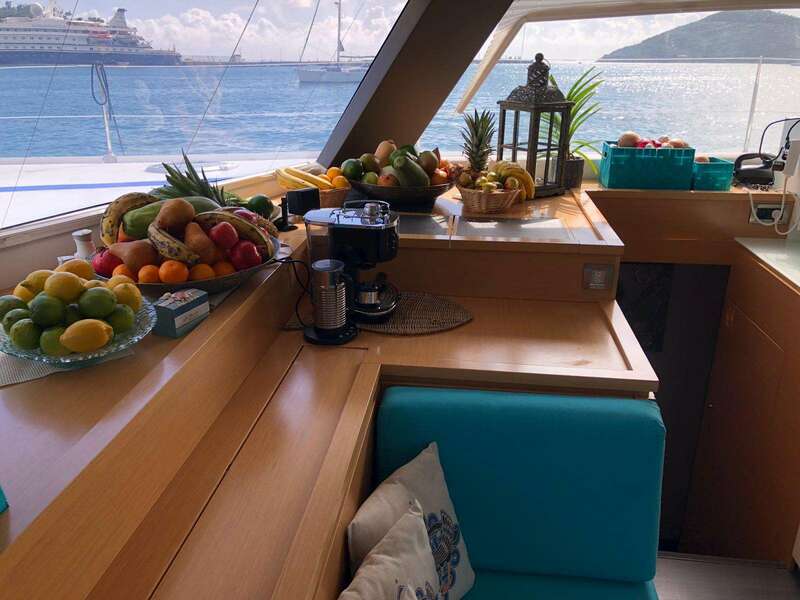 Owner�s cabin: With a King Sized central bed, the owner�s suite is for guests who wish to make the most of luxury on their sailing vacation. With large storage capacity from cupboards to shelving guests have everything they need in their cabin. Within, the Owners Suite there is a saloon area with a sofa, a large wardrobe and a desk with bookshelves. 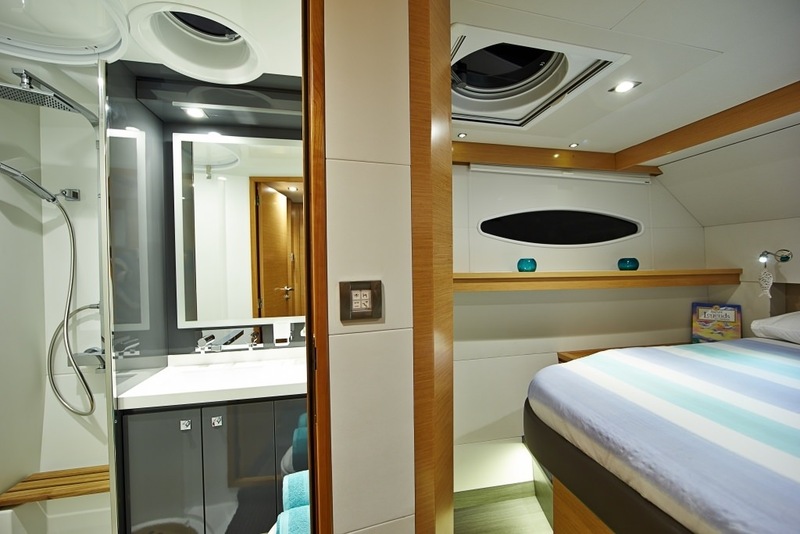 As mentioned all Cabins are en-suite, no exception here for the owner�s version. It is the largest of the bathrooms with two separate washbasins and a walk in shower accessed through a sliding glass door. 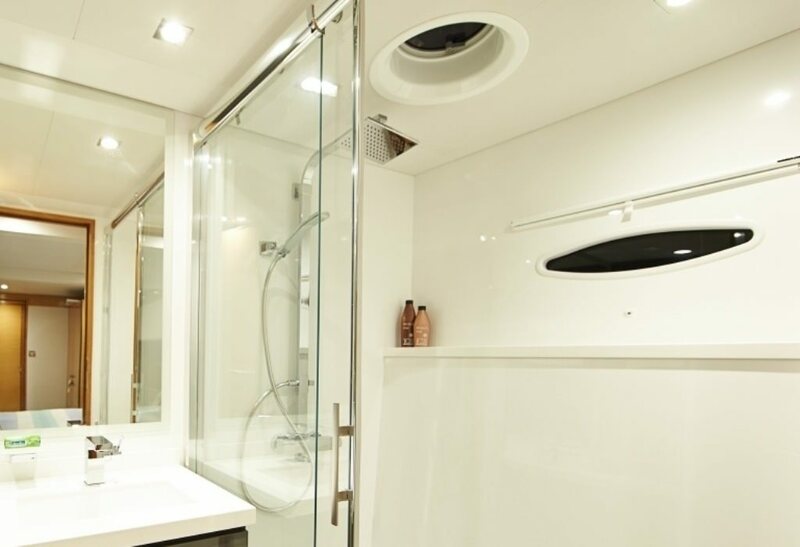 Aft Starboard: The Double Cabin with a queen size island bed (space on both sides) comes with an en suite bathroom accessed via a private wooden door, with a full length mirror mounted on it, in the aft companionway, with a modern shower unit and electric flush toilet. There is plenty of storage with cupboards and a wardrobe. 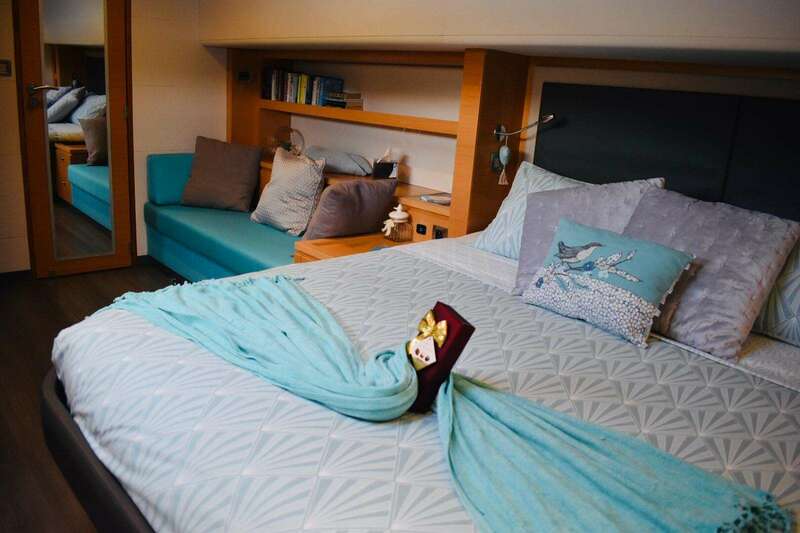 Mid Starboard: The double cabin, accessed via a secure wooden door with a full length mirror from the front passageway, fitted with a queen size bed comes with an en suite modern bathroom with a shower unit and electric flush toilet. There is plenty of storage with large space under the bed and cupboards around the cabin and a wardrobe. Forward Starboard: The double cabin, accessed via a secure wooden door with a full length mirror from the front passageway, fitted with a queen size bed comes with an en suite modern bathroom with shower and electric toilet. There is plenty of storage with large space under the bed and cupboards around the cabin and a wardrobe. 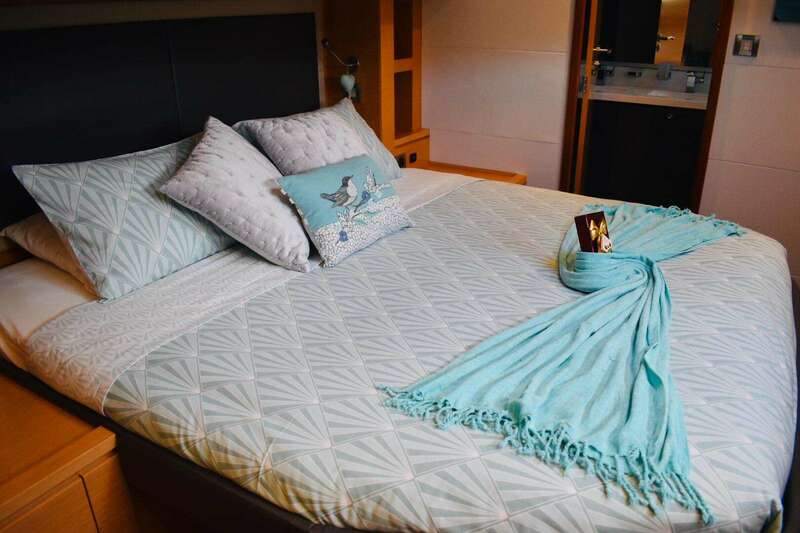 All cabins are equipped with blinds and mosquito nets on their portholes and they have power sockets to recharge the guests� electrical appliances such as cameras, cell phones, tablets or laptops, and of course all cabins are fully air conditioned. The Forward and Mid Starboard Cabins share a common staircase for access and the Aft Starboard Cabin has its own private access.